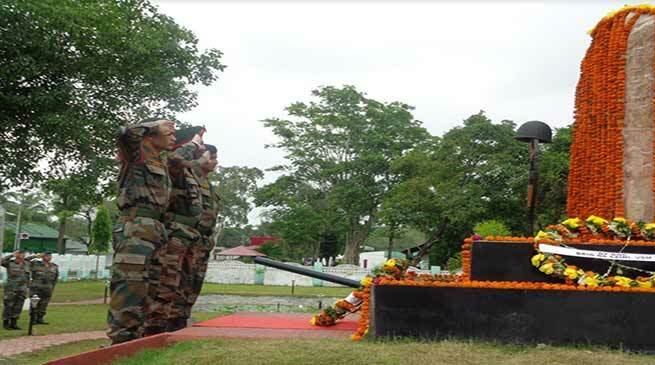 Red Horn Division of the Indian Army celebrated its 43rd Raising Day with a wreath laying ceremony at Rangia War Memorial, Rangia on 02 July 2018. The General Officer Commanding on behalf of all ranks paid homage to the martyrs who made the supreme sacrifice for the Nation. The ‘RED HORNS DIVISION’ is one of the oldest Division of the Indian Army and was raised at Secunderabad on 03 April 1943. This formation was tasked in combating insurgency and has acquitted itself in Operation Falcon and Operation Rhino with aplomb. The event was attended by many serving Officers, Junior Commissioned Officer & other ranks to mark years of dedicated service of the RED HORNS DIVISION to the Nation.